In 2008, a Delaware Family Court Judge asked Delaware Shakespeare to create an education program for at-risk and adjudicated youth. The judge felt that exposure to arts and culture can keep at-risk youth from “being outsiders…and can help them feel like they belong to the large society of humanity.” Delaware Shakespeare responded with The Bridge. The Bridge has two goals: to connect at-risk youth to “the large society of humanity” and promote positive life choices through examination of the choices that are made by Shakespeare’s characters. 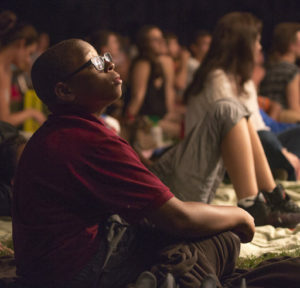 Two 60-minute pre-show workshops, focusing on connecting Shakespeare’s world and the themes of the play to the participants’ world. Attendance at the Delaware Shakespeare Summer Festival performed in beautiful Rockwood Park, along with a complimentary picnic. One 60-minute post-show workshop utilizing writing and improvisational exercises to put students “in the shoes” of Shakespeare’s characters and promote positive life choices. Each year a theme is chosen from the Summer Festival production around which The Bridge programming is focused. For Henry V, workshops will focus on the theme of leadership and against-all-odd victory stories. Boys and Girls Club of Delaware, the Residential Cottages at the Ferris School, UrbanPromise Wilmington, Nativity Preparatory School, Rodney Street Tennis Club, Elizabeth W. Murphey School, and the West End Neighborhood House. The Bridge is supported by the Laffey-McHugh Foundation, WSFS Bank, PNC Bank, and several generous individual donors. For more information, please contact David Stradley, Producing Artistic Director.